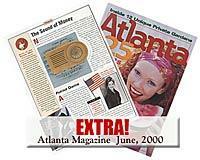 Top Honors for Stormy Weather for something a little different by someone named Susan Ottzen Music from Atlanta. 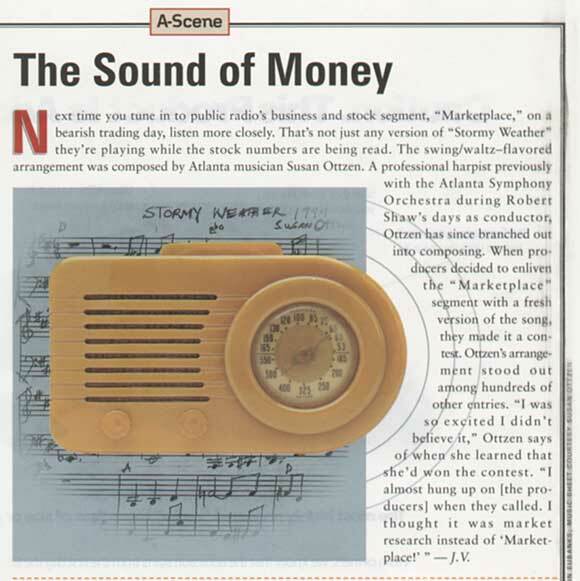 Public Radio International’s Marketplace program awarded Susan’s recording of Stormy Weather top honors in their “What’s Your Score” contest. It will be used frequently by the program as underscore for reading the Wall Street statistics (on days that the market drops). But don’t wait for the market to slide, listen below! This 3/4 waltz version of the famous swing tune features Don Erdman clarinet, Ben Coker guitar, midi orchestra Susan Ottzen, drum loops by Burning Grooves (Abe Laboriel Jr.), mixed by DeDe Vogt of the Sound and Fury Studio Fame. The whistling bells in the background may be a little reminiscent of Mark Snow’s music for the XFiles.